$6.99 to $24.99 & FREE Shipping on orders over $59 $35. This is a must have for any home brewer! No rinse, no worries, no contaminations! 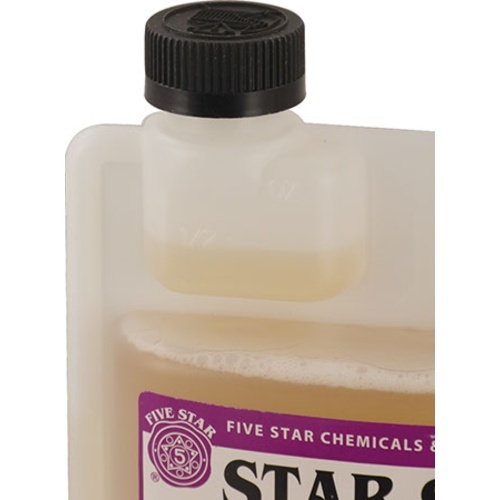 Star San is an acid based sanitizer that is quick, odorless, tasteless, and safe for most materials except softer metals. As a high foamer, it’s foaming action ensures coverage and contact time in larger vessels and better penetration into nooks and crannys. Any foam that is left over in your carboy or keg will not harm your beer or you. If you plan on making some up for spray application, it is best to use distilled or RO water to maximize the life of the unused portion (minerals in tap water reduce the shelf life of Star San once in solution). If a lower foaming alternative is preferred, for bottling or multiple batches, check out Saniclean. Shipping Restricted: This product is only eligible for ground shipment within the contiguous 48 states. It's a classic sanitizer that works great. Cleanliness 1st. Star San gets it done. In my opinion. This is the best sanitizer. why would not use StarSan???? Overwhelming positive reviews from amateurs and professionsals alike. Good price and was good product. used this product for several years now. Hands down the best sanitizer I've used. Mixed right 1 minute contact time and your good to go. To go with the draft system Christmas gift. Is it ok to use on stainless equipment? BEST ANSWER: Absolutely! That's what it's made for. You can sanitize stainless or plastic brewing equipment and its no rinse. Just make sure you dilute it correctly as per the instructions on the bottle. It does foam quite a bit so if you want the no for version use the five star SaniClean. I use it to sanitize everything to include stainless steel and have had no problems. Little goes a long way, keep a spray bottle of solution for spot san and seal checks.Great product every brewer should have. Yes, it's perfect for stainless, I've used this on stainless for over a decade. Yes. It is safe to use on stainless steel equipment. What is the shelf life for this product? I bought a 16oz size about 6 years ago and after about 60 brews with it I'm only halfway through the bottle. It seems to still work same as it did on day-one, just wondering. BEST ANSWER: It should last years. It is an acid based sanitizer. Long shelf life. I like having only one step to sanitize the wine making equipment It saves a lot of time and lessens the chance of making a mistake by missing one of the steps of the usual 3 step sanitizer. Great product and available in a much larger size than my local home brew store has available. I have never had any problems with items being unsanitary with using this product. Been using it since I started brewing several years back. I don’t brew without it works great for a no rinse sanitizer. Easy to use, great sanitizer. Great price. I have always used Star San since I started brewing a few years back. Great product. Worked as expected. Will buy again. Between this and Saniclean (low-foam) I have all my sanitizing covered. I use Star San no-rinse sanitizer for every step of my brewing process. From sanitizing carboys, racking canes, tubing, kegs, bottles, airlocks...... Easy to use and has never failed me yet! The only way to go when it comes to sanitizer. 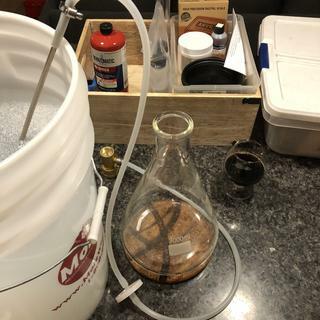 I have been brewing beer and making wine on and off for over 10 years. When i stick to using PBW and star sand together I rarely have any issues. At this moment as i think about this the only times i can remember having issues were when i did not use these two. I am definitely a believer in both and will continue to use them. Works great in cleaning my pots. Its starsan. Works great and I have yet to get an infection while using this product. Stuff works great... been using for years. Sanitation is a must for home brewing and this product is excellent. 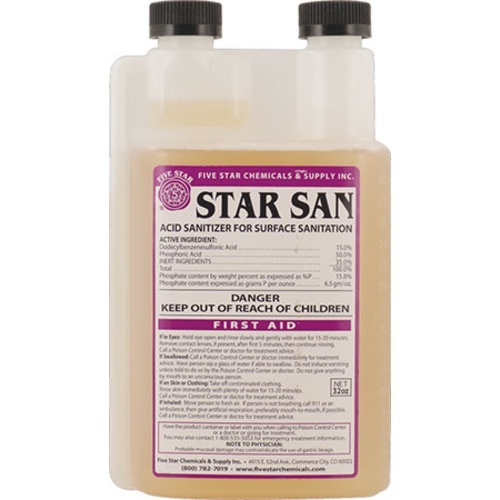 I have been using Star San for about a year and have had not problems with sanitation. The best features are the ease of use, fast action, and no rinse required. It is very economical for the value you get from it. This is the best! I have not had any problems with items treated with Star San. No contamination at all! I’ve been using starsan for years and I’ve never had an issue. A large bottle will last a very long time. Great product. Easy to use. Get comfortable with the foam and then you can use even less product as the foam will sanitize also. I only need a quart or half gallon to swirl in a standard 5-7gal fermentor to get all the surfaces coated in foam. So easy to use and works great. Star San works great, no rinse needed, great sanitizer! it worked well and sanitized all the equipment that I used for crushing, fermenting and storing the wine. I have not had a contamination since I started using Star San - it works. It is safer that Meta solutions, especially in confined spaces like my winery. When mixed as instructed, it is reasonably priced. This is a great product. We have been using it for a couple of years now and have never had any problems. We keep it in a spray bottle and spray down what we need sanitizer on. I keep my must stirrer on a hook and I can easily grab the bottle of star San and give it a quick spray. Wait a couple of minutes and it’s ready to go. Always works great and it’s very easy to use. So far I’ve never had a skunked batch after many years of brewing. This is what I expected, no issues to report. I’ve been brewing three years and this is all I’ve ever used for santization. Been using for years now and works better and is easier to use than any other thing tried. Works well but I had an older bottle of Star San that the cap was broken and for some reason even a fresh batch of mixed Star San is over 3Ph. I use this stuff on all my wine equipment. It is the best stuff on the market in my opinion. In the old days we used bleach. What an improvement! I love star San... use it religiously! Thanks! Easy to use despite scary looking container. Love ease of measurement, which allows you to use less accurately when sanitizing small batches. This spilled all over the other items in our shipment. Wasn't sealed properly & we only received a portion of the bottle. Does the job, easy to use, odorless, re-usable. What more can you want? Love the ease of use and the quality of the product. I love this stuff. Easy to use, I use it to sanitize everything that touches me beer. Never have had a contaminating problem. Great stuff. Couldn’t do without it. I used Star San to sterilize bottles rather than using potassium metabisufate. It was easy to use, did a great job on the bottles and hopefully will not corrode the corker.